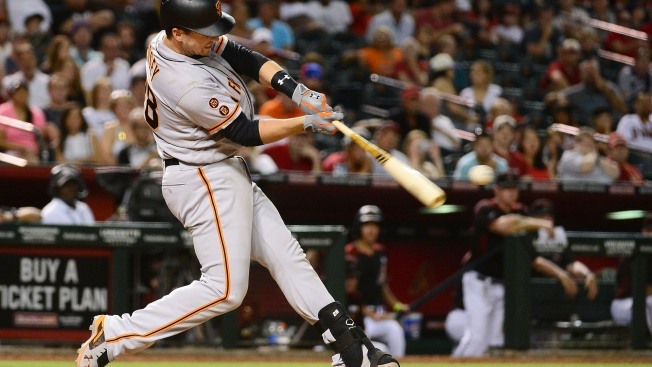 It was the Buster Posey power show Saturday in Colorado as he smacked two three-run homers and added six RBI to lead the Giants to a 10-5 win over the Rockies. Posey swatted his three-run first home run of the game in the first inning, giving the Giants an early cushion. Then, Posey really came up big for the Giants in the top of the eighth. After the Rockies jumped all over the Giants' bullpen in the bottom of the seventh inning for four runs, the Giants trailed 5-4. Posey went yard again in the top of the eighth, tying his career high of six RBI in one game. San Francisco plated six runs in the inning, taking a 10-5 lead. Madison Bumgarner last six innings, allowing just one earned run and struck out six batters. His ERA is down to 2.12 on the season. The Giants improved to 31-20 on the season.